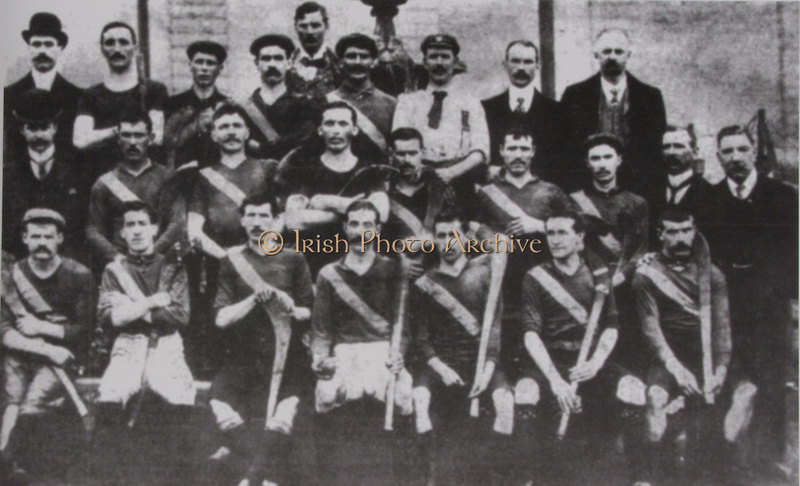 London Alll-Ireland Hurling Champions 1901. Back Row: W Douglas ( Hon Sec), P King ( Clare), J O'Connell ( Limerick), Tim Doody (Limerick), T Redmond (Wexford), Dan Horgan ( Cork), J McCarthy (Kilkenny), referee, L J O'Toole ( Sec, Central Council), J Shine ( Galway). Middle Row: J Tobin (Hon Treasurer), J Lynch ( Cork), Jack King (Clare), Ned Barrett (Kerry), C Crowley ( Cork), J Fitzgerald ( Limerick), M McMahon (Tipperary), M O'Brien, Wm McCarthy (President). Front Row: M Horgan ( Cork), Tom Barry ( Cork), J O'Brien ( Clare).